I went into my garden at half-past six on the morning of April 21, 1870, to think over the final orderof these examples for you. The air was perfectly calm, the sunlight pure, and falling on the grassthrough thickets of the standard peach (which had bloomed that yearperfectly), and of plum and pear trees, in their first showers of freshsilver, looking more like much-broken and far-tossed spray of fountains thantrees; and just at the end of my hawthorn walk, one happy nightingale wassinging as much as he could in every moment. Meantime, in the still air, theroar of the railroads from Clapham Junction, New Cross, and the Crystal Palace (I am between the three), soundedconstantly and heavily, like the surf of a strong sea three or four milesdistant; and the whistles of the trains passing nearer mixed with thenightingale’s notes. That I could hear her at all, or see theblossoms, or the grass, in the best time of spring, depended on my havingbeen long able to spend a large sum annually in self-indulgence, and inkeeping my fellow creatures out of my way. Of those who werecausing all that murmur, like the sea, round me, and of the myriadsimprisoned by the English Minotaur of lust for wealth, and condemned tolive, if it is to be called life, in the labyrinth of black walls, andloathsome passages between them, which now fills the valley of the Thames, and is called London, notone could hear, that day, any happy bird sing, or look upon any quiet spaceof the pure grass that is good for seed. But they might have the blessing of these things for all and each of them, ifthey chose, and that vast space of London mightbe full of gardens, and terraced round with hawthorn walks, with children atplay in them, as fair as their blossoms. And now, gentlemen, I beg you oncefor all to understand that unless you are minded to bring yourselves, andall whom you can help, out of this curse of darkness that has fallen on ourhearts and thoughts, you need not try to do any art-work,—it is the vainestof affectations to try to put beauty into shadows, while all the real thingsthat cast them are left in deformity and pain. Here, therefore, is the first of your Educational series chosen for you, not that you may try to copy, but that you may look at it, when you would be put in right temper for work. It will seem to speak to you if you look long; and say again, and yet again, ’´Ιδε—ό άϊρων. You will find the work of Cima of Conegliano referred to by me, long since, in the third volume of Modern Painters, as notable for its perfect painting of all lovely detail. His own Alps are in the distance here, and he shall teach us how to paint their wild flowers, and how to think of them. 2. 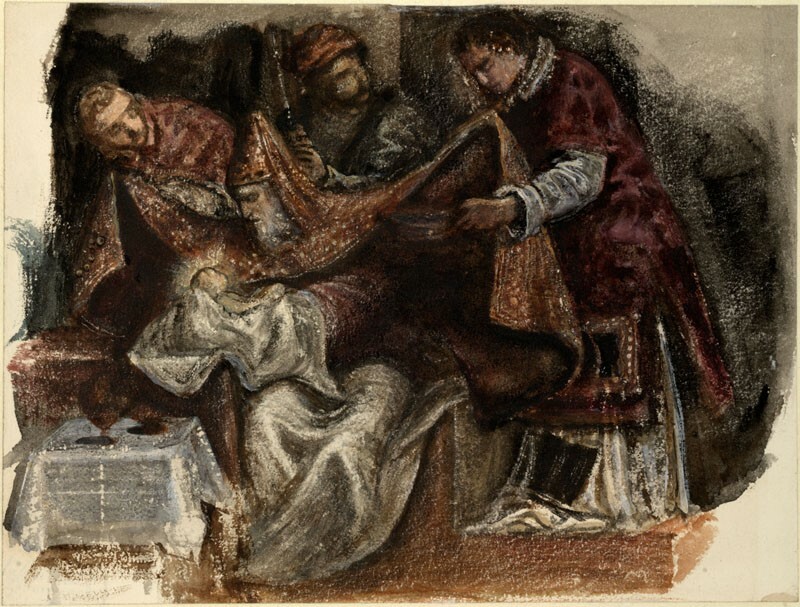 Part of the etching of the Light of the world. I have only given you the upper part of this subject, because its principal use to you will be in the character of the head, and in the relation of the background to it, both in thought, and beauty of visible realization. 3, 3B, and 3c. Studies of clouds. These are chosen only for their extreme simplicity in method of work, being little more than memoranda of the skies as they passed; that such studies may be useful, the forms of the clouds must be outlined with pencil from the clouds themselves, at utmost speed. Then the colour necessary to explain their mode of illumination is to be added from direct memory, before you look at anything else. Never attempt to finish notes of this kind highly, and stop in working on them the instant your memory fails, so that you may be able to certify their veracity as far as they reach. 4, and 4 B. Grass and clover. Grass for Triptolemus . Laurel” Apollo . Olive” Athena . 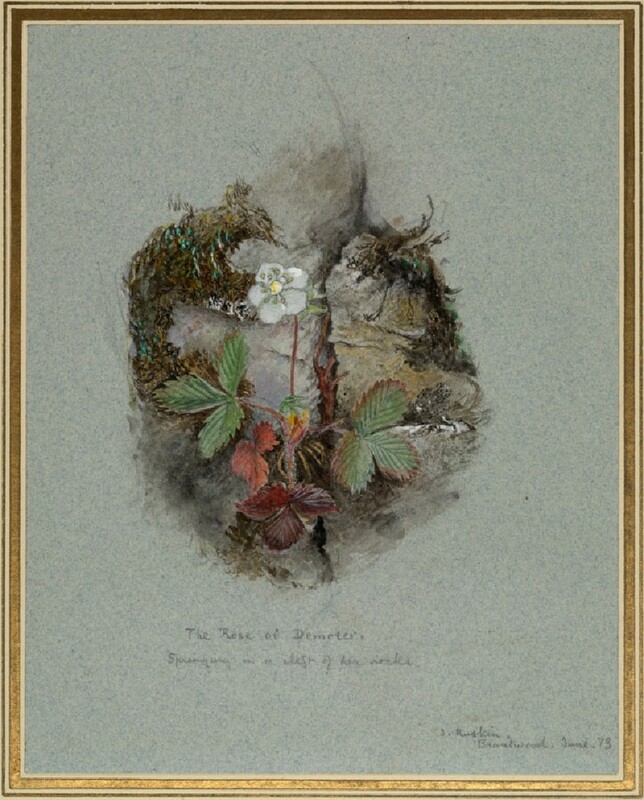 Wild Strawberry-blossom, (Rose-tribe)” Demeter . Fleur-de-lys” Cora . Lily” Artemis . Heath” Hephæstus . Vine and Ivy” Dionysus . Ilex” Zeus . Pine” Poseidon . Asphodel (Wild Hyacinth)” Hermes . House-leek” Hestia . Narcissus” Aphrodite . You see that this gives you the group of the great Olympian Gods; omitting Ares and Hera; but adding Triptolemus, Dionysus, and Cora. Ares has no real claim to be ranked among the greater Gods, for he represents merely the physical strength and rage of war; all the moral strength of war being Athena’s. But Cora-Persephone has deep influence over the Greek heart. Again, Hera is merely a collateral phase of the power of Zeus, scarcely distinct from it; but Dionysus, in his nobler authority, however closely related to Apollo, has absolutely distinct power. You had better learn my list by heart, therefore, remembering that you have to put Hera and Ares back into their places when you want to name the twelve Olympian Deities. 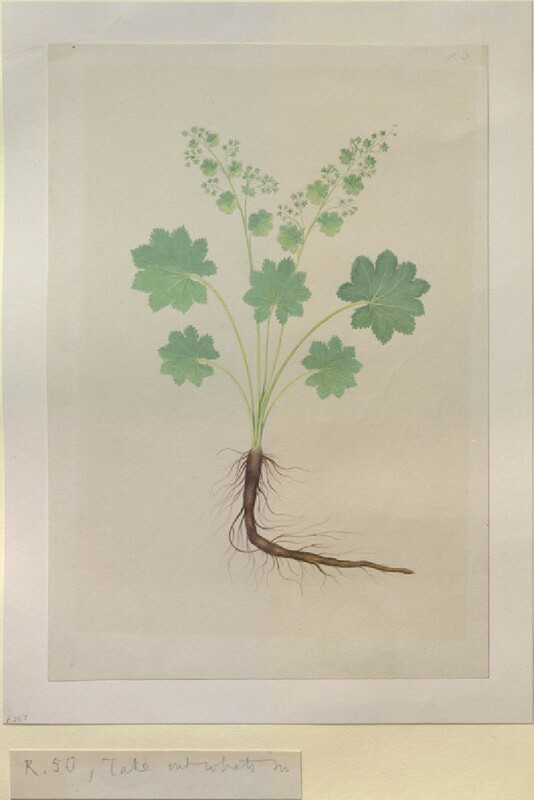 The grass and clover come first; given to Triptolemus as the leading representatives of pasture, corn, and pulse, which are the three essential gifts of the earth under agriculture, to man and beast. 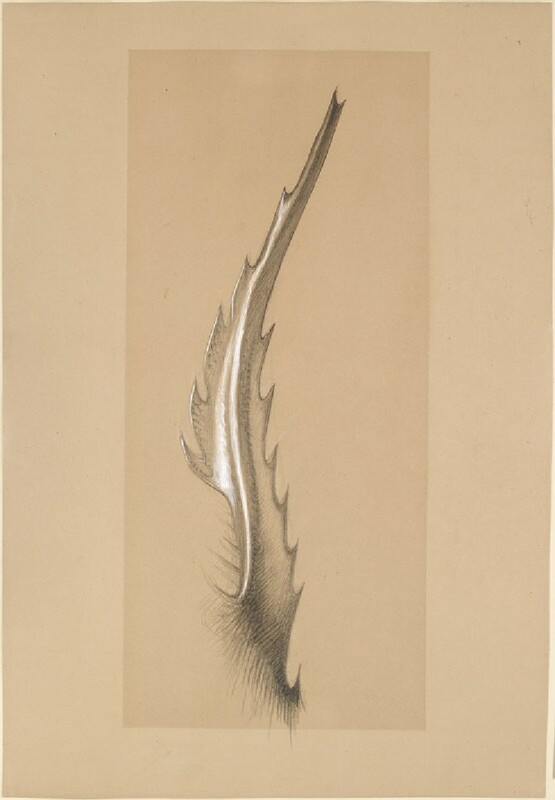 Then compare Numbers 23 C, and 126: especially the last; where the little pencil sketch of mine under the print from Le Normand gives you the archaic type of the dragon’s head and wings, just behind the head of Triptolemus himself: showing you how these signified first the germination of the root and leaf; in later work, the wings of the chariot signify the cloud giving rain, Triptolemus being then preceded by Hermes, the lord of clouds. 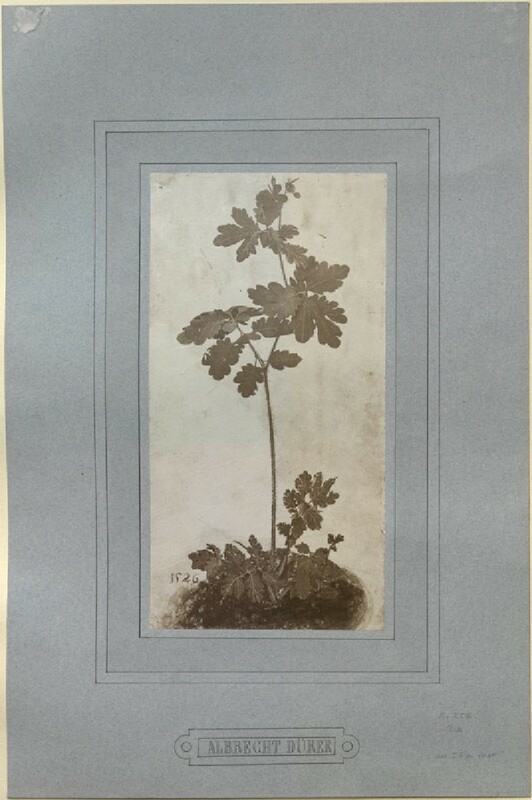 The sketches of clover blossom are out of my botanical note-book, and only on blue writing-paper; but they are far carried in showing the oblique action of the blossom as it emerges from the green involucre, and if you can copy the foreshortened trefoil leaf in the uppermost on the left, it will be serviceable practice. 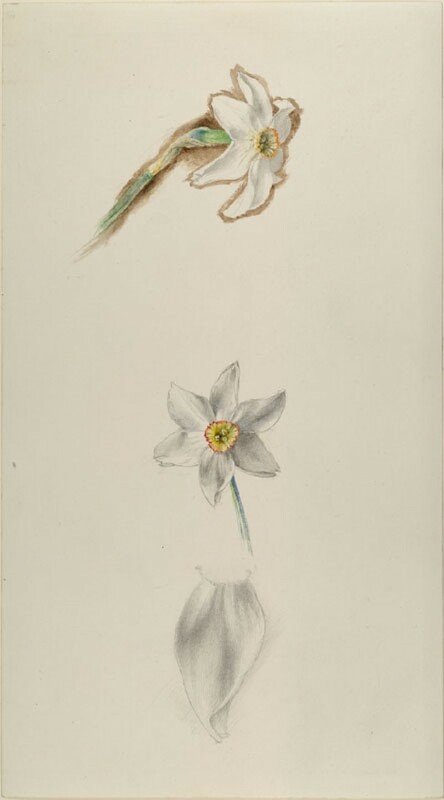 The coarse ink sketch is of the calices of the separate flowers. Measure and copy this, with thick dry colour in your brush. It will show you in the outset, that refinement in design does not depend on the minuteness or fineness of work, but on its precision and care. These lines look coarse, but you will find they cannot be altered in the curvature even by a small fraction of an inch without losing grace, and that it is very difficult to follow their curvatures without altering them, owing to their continual subtlety of change. Also, it is not possible to express the general characters of growth in noble vegetation, with fewer or simpler lines. 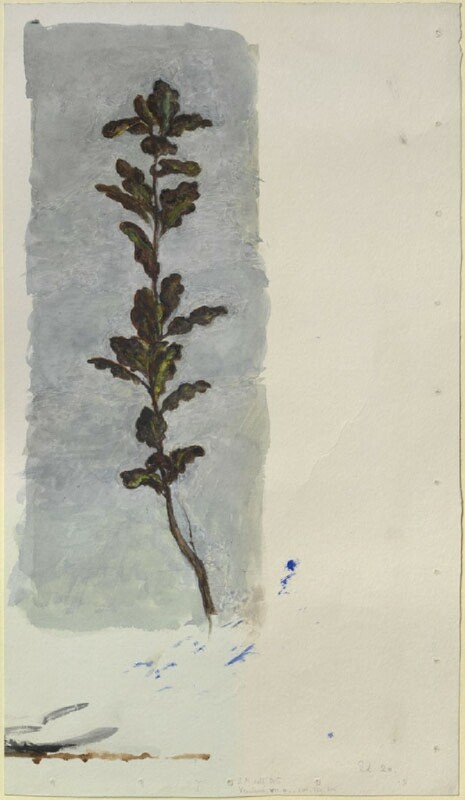 It is easy to make leaves and stems graceful, but not to make them springy and vigorous as well: and the especial beauty of this group of foliage as terminating the rod of Apollo is the strength with which it is springing, and the visible presence in the god’s virgin sceptre of the life which in the king’s is lost. Look at the words of the vow of Achilles. Note the quaint little leaf at the bottom, which you would think had been drawn wrongly. In vulgar design, everything is equally graceful; but in fine design, there are local uncouthnesses, as, in fine music, discords. 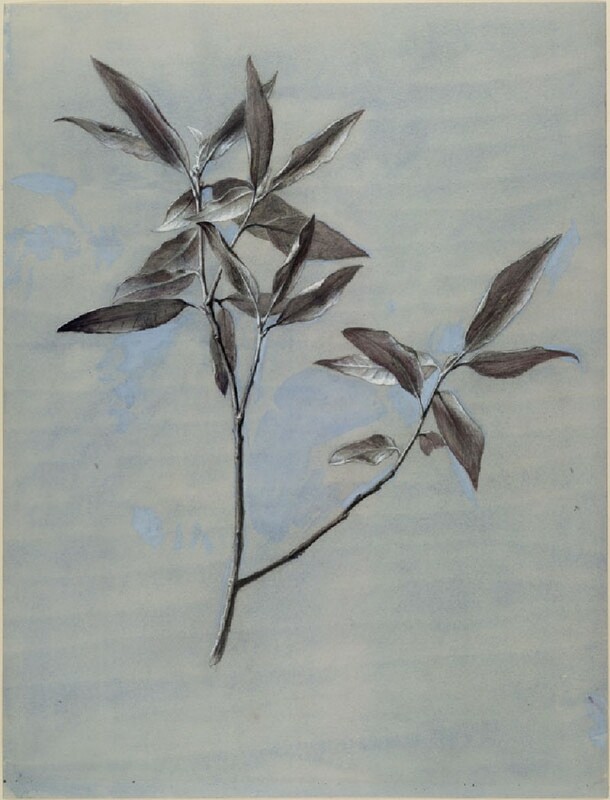 For the rest, the diminution of the stem for each leaf is much greater than it would be in reality: this is a necessary conventionalism, in order to terminate the strong rod within brief limits; but nothing can be more perfect than its rendering of the universal law of ramification; and even the apparent coarseness of the lines is only caused by enlargement of scale, for this example is much magnified; in the original it is only about an inch high, and the lines are thickened by cross strokes, not by deeper engraving. Olive. 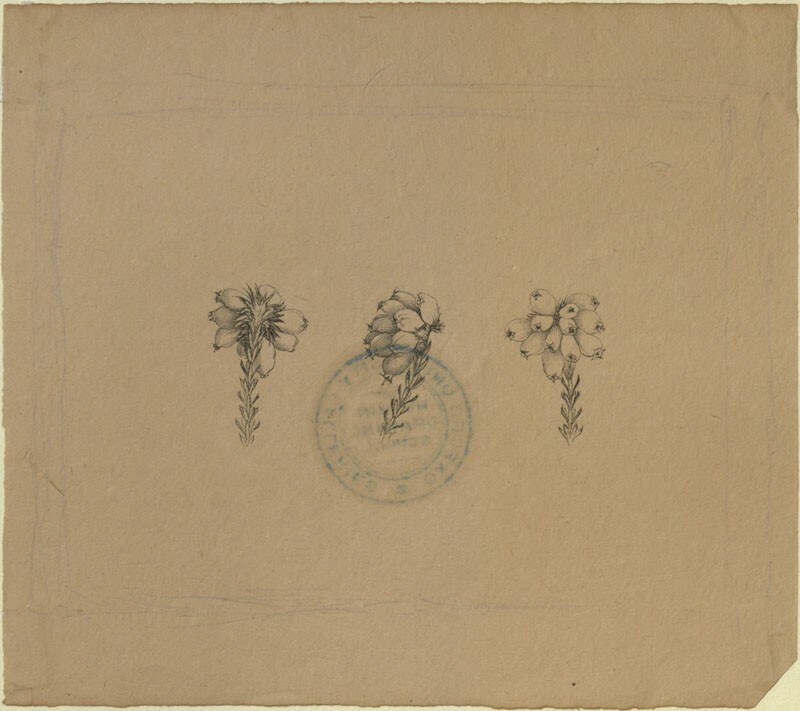 I will draw you a fresh spray, to be put in the place of this; ultimately this is to belong to the lower school, being an elementary study in pencil drawing with the point, the outline here and there fastened with the pen. 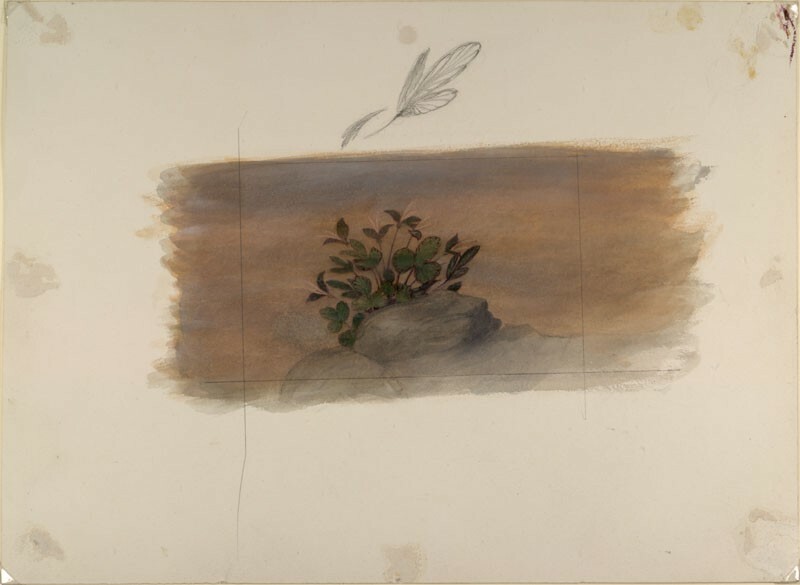 No tint of water-colour is used anywhere in this drawing, and it is an important exercise in the tapering and insertion of the leaf-ribs. Wild strawberry blossom, with the profile of it enlarged beneath. This also is only here temporarily—the exquisite mode of branching and budding in this flower must be analyzed in a better drawing. Compare, for the present, the enlarged plan of the relation of this first blossom to the uppermost leaf, 5 K in case XI. I give the strawberry-blossom to Demeter because it is the prettiest type of the uncultured and motherly gifts of the Earth. Also, I take this blossom as the kindest and usefullest representative of the Rose-tribe; and in a sort, the most central, for if I took Rosa Canina instead, it would not suggest the great groups of the potentillas and tormentillas; nor the relation to the anemone through the Dryas: but this strawberry-blossom expresses the place of all these, and yet is itself clearly a little white rose. I have myself no doubt, though I would not venture yet to ask you to accept my belief, that the iris, not the violet, is the true ίον of Greece; the ίον of Pindar at the infancy of Iamus is the yellow water-flag; and it is the splendid purple of the dark iris (still an entirely common flower in Greece; ad pagos per totem Græciam frequens, Sibthorp’s Flora Græca, vol. i, plate 40 ) which gives rise to all the expressions respecting the purple of the sea, or of shadows. Note further the relation of Ion himself to the dew, under the rocks of the Acropolis, and to the Earth, throughout the whole drama of Euripides. Triptolemus also, when he is the spirit of Agriculture generally, bears a rod in his hand with the fleur-de-lys for its top; and that Greek form of it is the real origin of the conventional types of the Byzantine, Florentine, and French one. I give it to Cora, therefore, rather than the violet and narcissus: and in its pure white Florentine type, ( the red fleur-de-lys is given, from the tower of Giotto, further on in the series ), it being quite the most lovely expression among plants of the floral power hidden in the grass, and bursting into luxuriance in the spring. 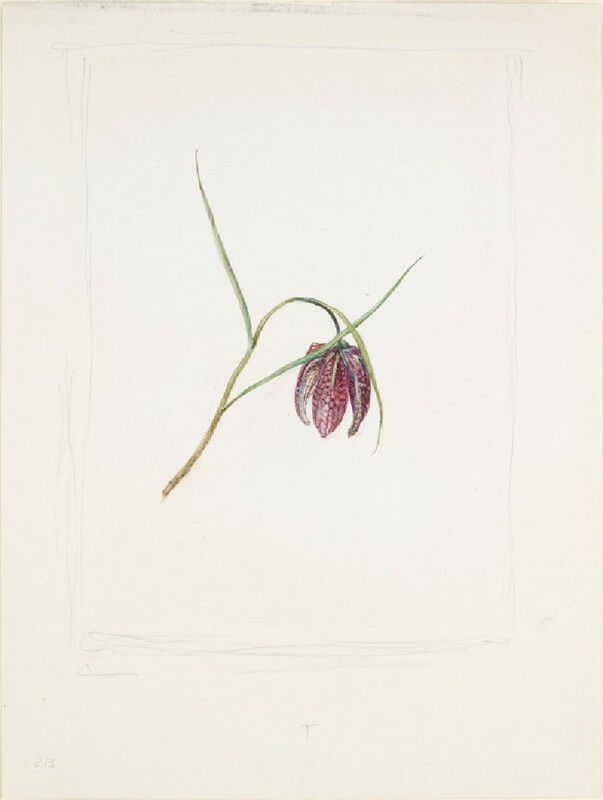 Fritillaria; which I want you to call Alfred’s Dew-flower. Read first pages 96-99 in my Queen of the Air ; then note that this Fritillaria is the best wild type you have near you of the true lilies, which have for their perfectest form the lily of the Annunciation; but I draw this wild Fritillaria instead of the white lily, because it expresses to you most closely the connection of the lilies with the Rush tribe; and through that with the sedges and grasses; and I have made the pencil drawing as well as the coloured one to make you feel, as you draw it accurately, the way the round rush-like stem emerges out of the sedgy leaves, and the character of the pattern, which is one of the instances, innumerable, in which the power of nature mocks us by the mimicry of one thing for another. Evidently this speckling of the blossom is intended to mark its relation to the granulated heads of grasses: one of the black-headed marsh-grasses which grow with this Drosida looks as if it could easily change into the speckled flower. This group will contain, besides, the rhododendron and Alpine rose;—the last we may keep for Aglaia, leaving the Erica for Hephæstus, because its name seems to come from its having been rent from the rocks either to serve as fuel, or for a couch of rest after labour among the hills. 11 to 11 D. Vine, cowslip, currant, and ivy. 12 and 12 B. Oak and ilex. The last with a dark background to show the lustrous leaves, and meaning of Virgil’s, aut ipse coruscis, quum fremit ilicibus, &c.
The black spruce and the stone-pine are both of equal importance in the Greek mind; as relating either to the mountains, or the sea and ships. But the true pine, whose double leaves give it the epithet διπλόθριξ, grows continually by the sea-shore, and is properly the one sacred to Poseidon. This piece of landscape, showing a bay of the Mediterranean through the stems of the pines, will give you some idea of the mingled grace and strength of the tree, where it grows on crag, and is tried by storms, as among the Greek islands. 15. Field Narcissus of the Alps. This is the best European representative of the Amaryllis tribe; and is in the pastures of the lower Alps of Savoy what Christ’s lily of the field (Amaryllis lutea), was in those of Syria. Our own two principal spring flowers, crocus and snowdrop, of which I shall give full illustrations in the lower school, seem to be given in their abundance and brightness, as types of the two great religious faiths of men in their common truth: the crocus is the Irid and Ion of the Ionian; and the snowdrop is the Amaryllid, the field-lily of the Christian; literally the clothed grass of the field. 16. 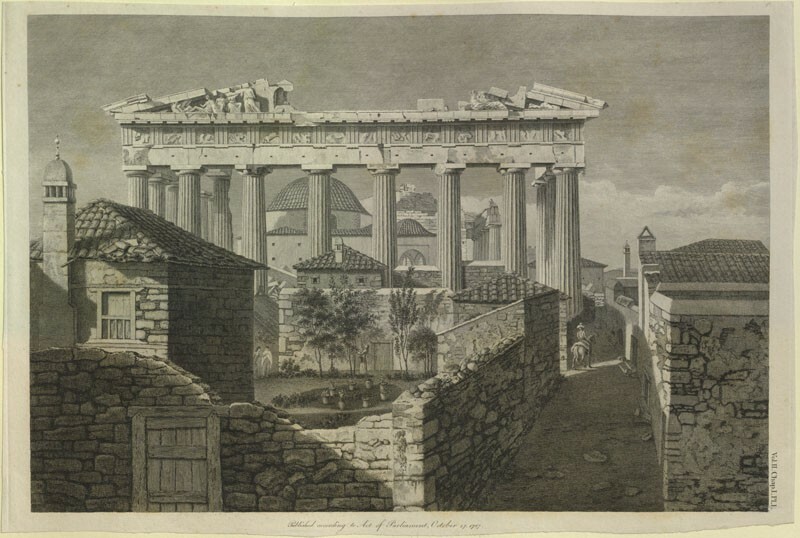 The East End of the Parthenon. I have not given you these plates from Stuart’s Athens merely for the sake of their subject, which they by no means well express, though they are precious, as, I believe, the only trustworthy documents extending back so far.But I have cut my book to pieces, and framed these old engravings chiefly for the sake of their modesty, earnestness, and honesty. They are not works of genius (either in draughtsman or engraver); they are not even felicitous or pleasing works of no genius; but they are absolutely sincere and simple in aim; industrious and faithful work, done in a good cause, and with no desire for display; and, therefore, for their own sake, no less than that of their mighty subject, I make them your introduction to the discipline of art. 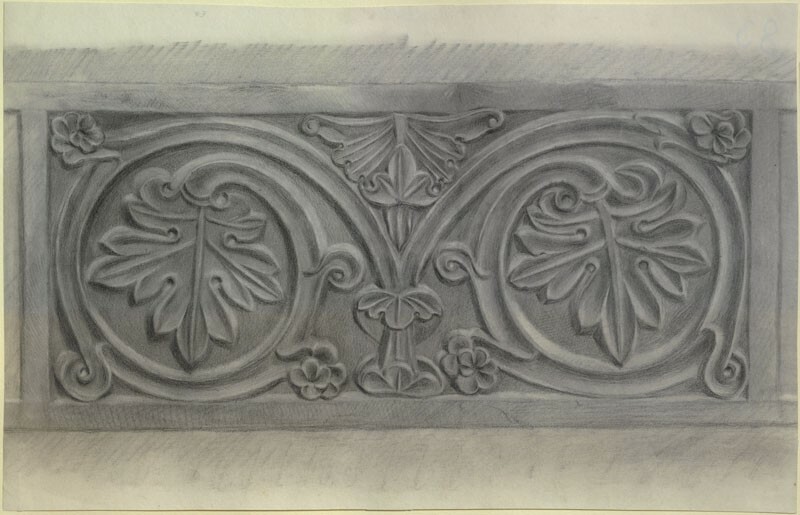 I can take little further notice here of the subjects in this cabinet, as they are only material for my lectures on Architecture: but I wish you, every one, to draw the curve of the Parthenon capital, 17 B , as a first lesson in purity and precision of line. 23 C. Demeter, Cora, and Triptolemus. Le Normand, tom. iii. pl. 64. From a vase of the time of incipient decadence, the lines becoming loose and vulgar. I want you to copy of it, only the plough in Cora’s hand ; but the design is interesting, because, comparing the wings of the car with those of 23 G , you will see that one of their meanings, at all events, is the cloud with dew and rain as necessary to the growth of the seed: also, though in a late vase, the fox-like head of the serpent is of an archaic form. See the Note on No. 126 at p. 29. 23 D. Selene in White Clouds at Midnight. The wings of the horses, with their spots, and guttæ, and the broken spirals of the chariot, variously express the cloud powers of dew, rain, and circling breeze. 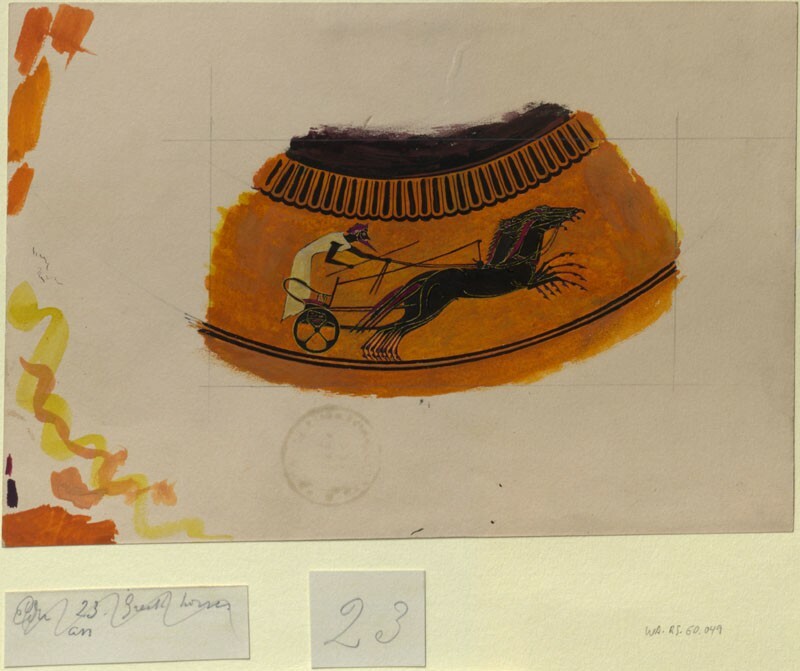 Compare the Hermes as the cloud (S. 208) . The breaking of the border of the patera (by the sphere of the moon) is a license characteristic of fine design of all periods. There is always a curious instinct in a good designer to show that he can go beyond his assigned limit, if he chooses; and that circumstances are sure to happen somewhere which make it right that he should. See Note on 23 I. This is a very archaic, but characteristic and sufficient example of the contest between designs representing the good and evil powers, which formed the first elements of Greek religious design. Observe that in all of these,Heracles is manly human power in contest with disorder and pain. Athena is physically the air; mythically, the sacred Spirit of wisdom, and strength. Hermes is physically the cloud; mythically, the guiding and moving force in the order of heaven. Athena’s crest nearly always surmounts the boundary line of the subject, to show her reign in the two Æthers. Heracles usually fights the Nemean lion, and Athena herself the giants; the Spirit of life first conquering the physical and monstrous resistance of the elements; and then human heroism conquers the merely bestial rage. A careful drawing by Mr. Burgess, which will show you that all these engravings can be copied by pen and pencil, if you choose. But it is terribly difficult to leave the white lines, as in this drawing, between two delicate black ones, afterwards filling in the field with black. 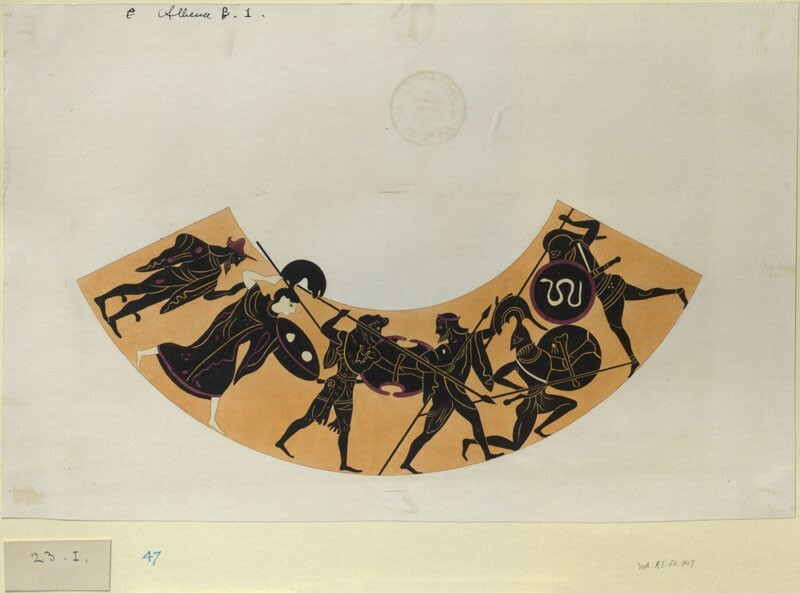 The white lines on the Greek vases are incised; and it will be good practice, if you are not skilled enough to leave them clear, to lay the black field first, and draw the white lines with body-white. But Mr. Burgess’s way is the only quite satisfactory one. 26. North porch of the west front of the Cathedral of Amiens. 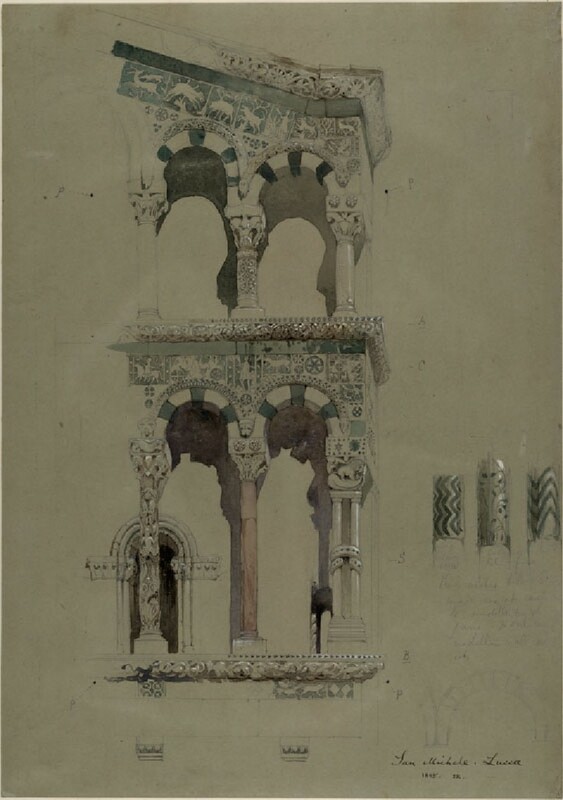 Sketch taken before its restoration. 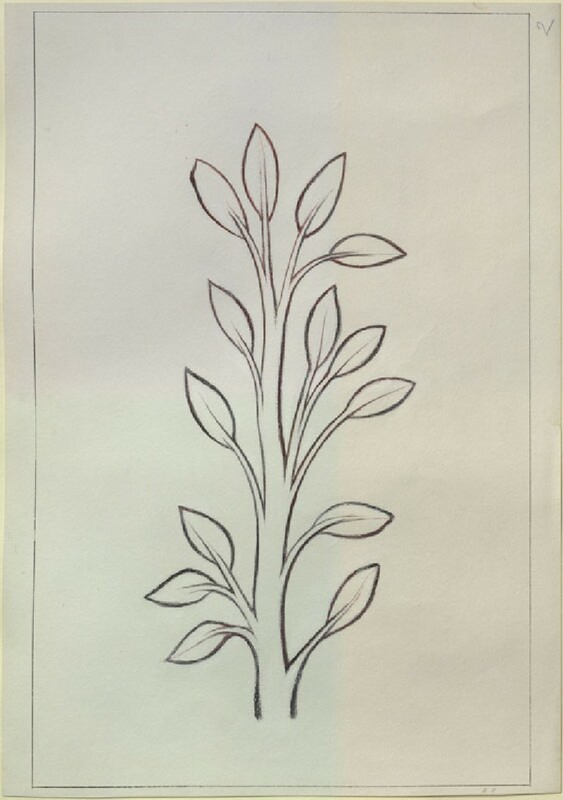 I introduce you to Gothic design by this memorial, now valuable, slight as it is, of what was, at the time the sketch was made, one of the most beautiful things in all the world. 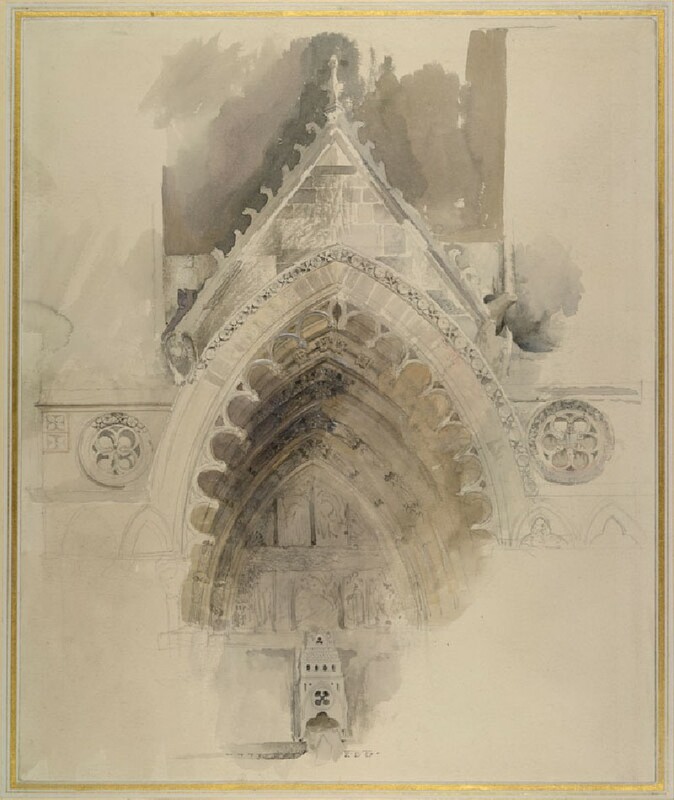 The colour of the front of Amiens, in 1856, was an exquisitely soft grey, touched with golden lichen; and the sheltered sculpture was as fresh as when first executed, only the exposed parts broken or mouldering into forms which made them more beautiful than if perfect. All is now destroyed; and even the sharp, pure rose-moulding (of which hardly a petal was injured) cut to pieces, and, for the most part, replaced by a modern design. 27. Norman Chapel near Abbeville. It is two miles from Abbeville on the old Paris road through Amiens. The photograph was taken under my own direction, as also 30 H.
It may seem at first absurd to call a series of twenty-five pieces only, illustrations of the course of Gothic art. Nevertheless if I can make you feel the qualities of the work, in stone and engraving, of these twenty-five subjects, you will most thoroughly understand the entire system of mediæval northern design. Briefly, No. 27 gives you the primary form and elements of ecclesiastical architecture. 28, a central type of its pure sculpture at the period of its strongest reign. 29, a quite balanced example of perfect Gothic, uniting all its elements; figure-sculptures, diaper surface-ornament; foliation, and absolute simplicity of mechanical structure in gable and arch. 30 and 30 B give you characteristic English Gothic, when it separated itself from German and French. 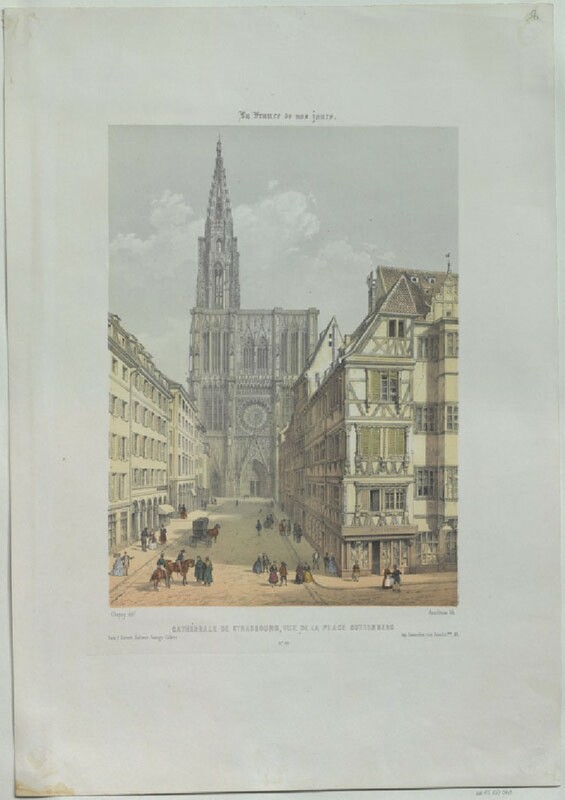 30 D, the grandest achievement of Gothic architectural science; 30 E, G, and H, the relation of late Gothic to domestic life; and 30 F and 30 I, the causes of the ruin of Gothic, and much else. Then the various subjects chosen from Holbein and Dürer will sufficiently express to you the effect of the intellectual power in the north which led to the Reformation. I do not give you any of the works of the exponent of Catholicism in the north, Memling, because northern Catholicism is always shrunken and feeble compared to that of Italy. But in the next Cabinet you will find the examples are all chosen to exhibit the full force of pure Catholicism in Italy, and of the highest Christian art, which is its expression. 30 F. Street in Strasburg. This modern view is, as you will readily perceive, not given as admirable or exemplary, but as an exponent of opposite qualities. The contrast between Nos. 30 E and 30 F is partly in the real scenes, partly in the art of their representation. Practical modernism has removed, as an obstacle to traffic, the fountain which gave Prout the means of forming the whole into a good composition; (I saw it in 1835, but forget how long it has been destroyed): and has brightened and varnished the street and the old timbers of it, as best it may, to look like a Parisian boulevard. And poetical modernism exhibits the renovated city with renovated art. 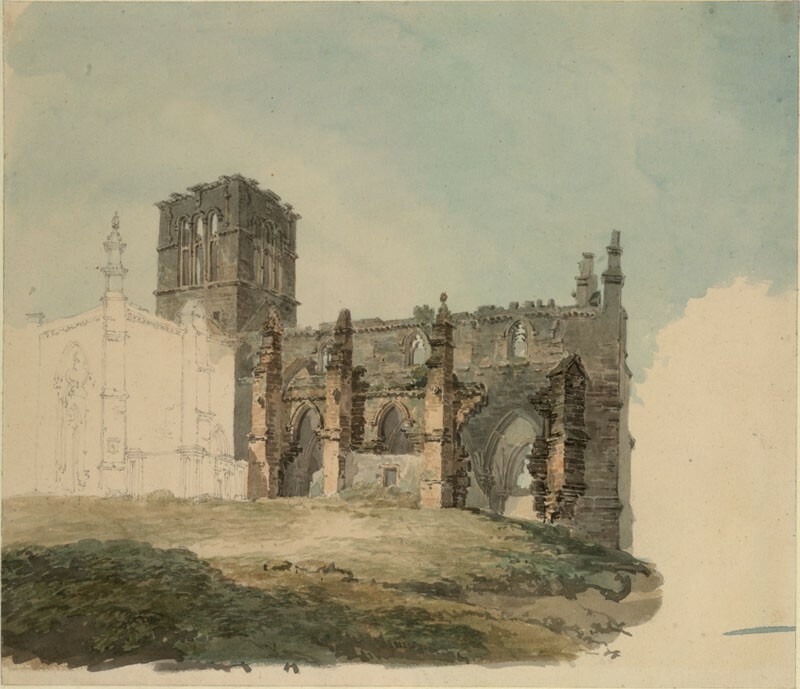 Yet, remember, Prout’s delight in the signs of age in building, and our own reverence for it, when our minds are healthy, are partly in mere revulsion from the baseness of our epoch; and we must try to build, some day what shall be venerable, even when it is new. 31 F, 31 G. Woodcuts from Dürer’s Apocalypse . Chaps. XVII., XVIII., XLII. Whenever you have no time for long work, copy any piece, however small, of these woodcuts with pen and ink, with the greatest care. I will add sequels to each in a little while; but I do not choose to disturbyour attention by multiplying subjects. I want you to know every line in these two first: then you shall have more. 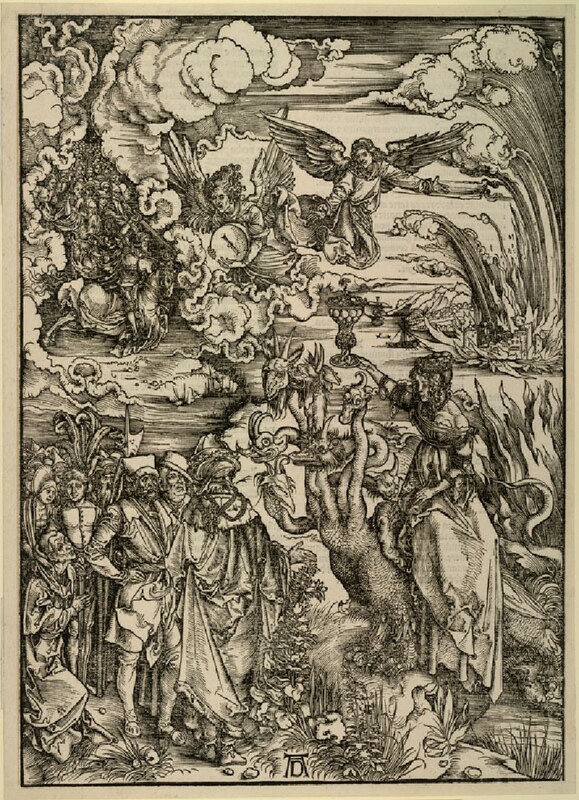 I give you these two, rather than any others of the series, first, because there is the greatest variety of subject and woodcutting in them; secondly, because Dürer’s power over human character and expression is shown definitely in them, together with his wild fancy; lastly, because they are full of suggestions of thought. I cannot give you any clue to the direct meaning of the chapters illustrated by them; nor will I enter here on any close enquiry as to Dürer’s interpretations. But if you read them in their secondary and general purpose, and consider one as the worship of false wealth and intellect, and the other as the worship of false pleasure, you will probably get nearer their sense than by narrower conjectures. It can hardly be doubtful that Dürer himself, (in his sympathy with whatever part of the Passion of the Reformation was directed against the vices of the Roman Church, but not against its faith,) meant the principal group in No. 40 to indicate the contentment of men of the world in a religion which at that time permitted them to retain their pride and their evil pleasures; and the wonderful figure of the adoring monk on the left, to express the superstition which could not be disturbed by any evidence of increasing sin in the body of the Church. But you had better read all as among the great designs which are produced almost involuntarily by a faithful workman’s mind; and which are capable of teaching different truths to successive generations. 34. Tomb of Can Grande. The essential difference between Italian and Northern Gothic is in the simplicity and dignity of Italian figure-sculpture, and together with it, of such floral ornament as may be fitting; rarely far divergent from classical types in method of disposition, but treated with a finish of surface never given by the ancients to flower mouldings. No Italian architecture can be properly represented unless when painted of its own size. I had to leave the drawing, No. 34, unfinished, that I might draw the sarcophagus larger; and the sarcophagus, 34 B , unfinished, that I might draw its details full size. The piece of its cornice, 34 C, cost me great trouble to paint; the entire beauty of the sculpture depending on variety of flow in line, and curvature in surface, which needed finishing like the roundings of flesh. The method of treatment in the original work is examined in my Lectures on Sculpture . 35 B. Gryphon, bearing south shaft of entrance of Duomo, Verona. No. 108, in Case VII., gives you the early Greek and Egyptian types of solar powers from which this Lombardic Gryphon is composed; the wheel-like designs on the Egyptian Lion’s sides becoming true wheels in the Lombardic design: the spots on the panther-skins of their priests’ dresses are oftenexpressed by the same stellar figure, and have relation to the stars themselves. The gryphon here, at Verona, as in Dante’s Vision of Beatrice, is entirely a type of sacred power. 35 D. Part of the destroyed Church of St. Michael, Lucca. It was destroyed by having its façade, one of the most precious twelfth century works in Italy, thrown down, and rebuilt with modern imitative carving and the heads of the King of Sardinia and Count Cavour instead of its Lombardic ones. This, and the following drawings, as far as 39 , with the pilaster, No. 43 , are given to illustrate the Italian use of coloured marbles. 41. Gate of the School of St. John, Venice. 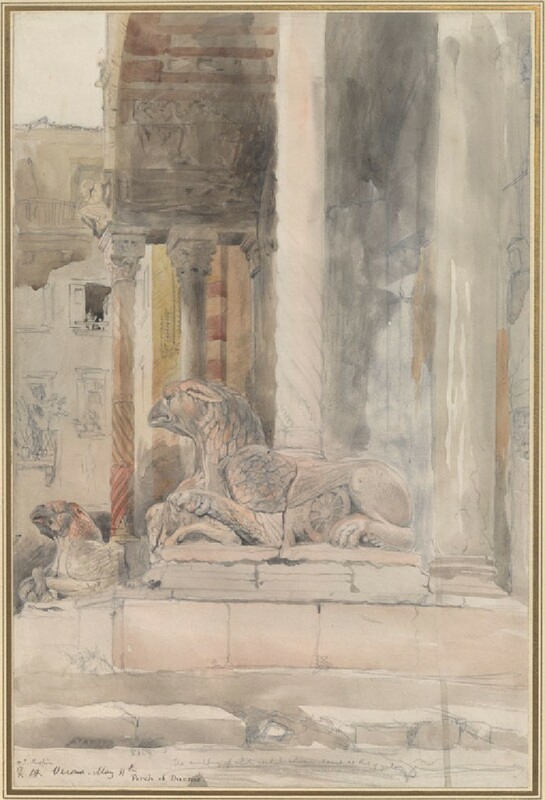 This and the five following subjects illustrate the delicate school of classical architecture which was developed in association with accomplished painting in Lombardy in the fifteenth century, chiefly under the influence of the Bellinis, Mantegna, Lionardo, and Luini. It was overpowered by the sensational and dramatic—essentially unclassical—schools of Michael Angelo and Raphael in the south: and with it perished the hope of the arts in Europe. I terminate the series illustrative of Italian design, therefore, with three entirely characteristic examples of the painting contemporary with it, or slightly preceding it . The Annunciation. Filippo Lippi. From a small tempera painting in the Academy at Florence; (my study, No. 50, gives the head of the Angel Gabriel of its real size, and is very nearly a fac-simile of it in the lines of the hair and arrangement of the rose-garland). 48. 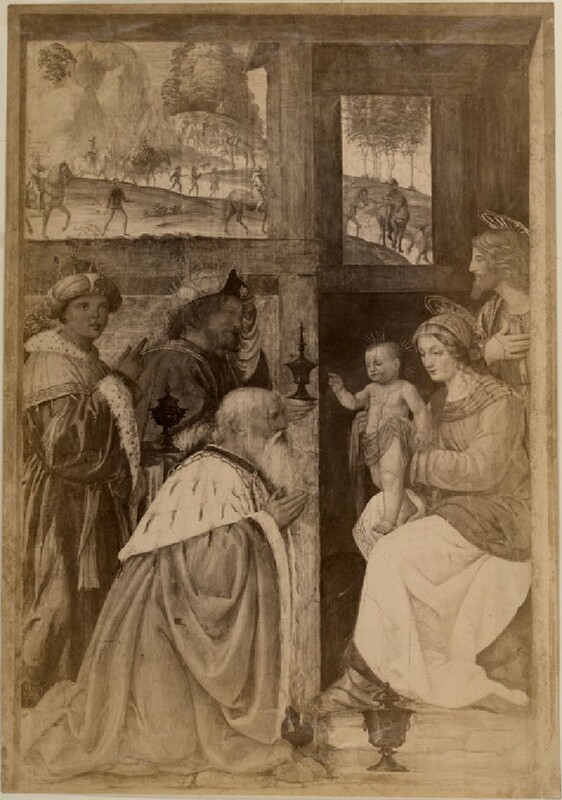 The Nativity, from a picture by Filippo Lippi, in the Academy of Florence. These two examples, unimportant as they seem, will, nevertheless, give you a clear idea of the best religious work of Florence, and, therefore, of Europe and if you quietly and repeatedly compare them with, designs by any other masters, you will find their beauty manifest itself as unapproachable in its kind. Lippi is as sincere a monk as Fra Angelico, and he is a much stronger painter. The Adoration of the Kings. Bernardino of Luino. This photograph is more successful than usual in rendering the finer qualities of the fresco from which it is taken, and those qualities are consummate. Luini (it is convenient to use the name hitherto given to him) is absolutely alone among the painters of Italy—therefore, among those of the world—in uniting consummate art-power with untainted simplicity of religious imagination. I do not say, observe, religious faith. There is a wide interval between Lippi and Luini in this respect. Filippo Lippi , whatever other impression may have been conveyed by traditions respecting him, is, I have just said, as sincere a monk as Angelico, and hisheart is profoundly engaged in his faithful devotion, and in the representation of the Beings he worships, and of whose existence and power he is utterly convinced. But Luini, without having admitted in his mind any degrading doubt of his religion, does not in the least rest his life upon it, but reads its traditions as the loveliest poetry he can find, and paints them, as he does those of the Greeks, by the simple power of a contemplative imagination, unsullied by ambition, avarice, vanity, or discontent with life. He is a painter of immense power; (stronger even than John Bellini, and on full level with Veronese); but he never for an instant uses his strength for display, and is apt even to veil and subdue it, lest it should spoil the naive simplicity of his thoughts, or interfere with their direct appeal to the spectator. For instance, in this very fresco, you will at first think the ermine of the kneeling king ill-painted. It is, indeed, sketched with a few hasty touches—the entire shoulder, chain, ermine, and all certainly did not cost Luini ten minutes’ labour. Had he sketched it in a vulgar and false way, like Rembrandt, or an ostentatiously right way, like Velasquez or Veronese, every one would have called it wonderful, or felt it to be beautiful. But he will do nothing of the kind. In a somewhat reserved and hard manner, yet with a quite insuperable facility and felicity of handling, he strikes upon the wall his sufficient realization of the chain and ermine; at the same time, with all the care of a Greek designer, arranging the black touches, and the light links, so that they may precisely answer their pictorial purpose of bringing down some of the complexity of the landscape, and its stems of trees, into the flat masses of the lower part of the picture. This done, he puts all his strength into the head of the king; and in that, you will find no slight work, nor absence of any noble quality. See farther the notes on 3 G in the 10th Cabinet . 50. Head of the Angel Gabriel. 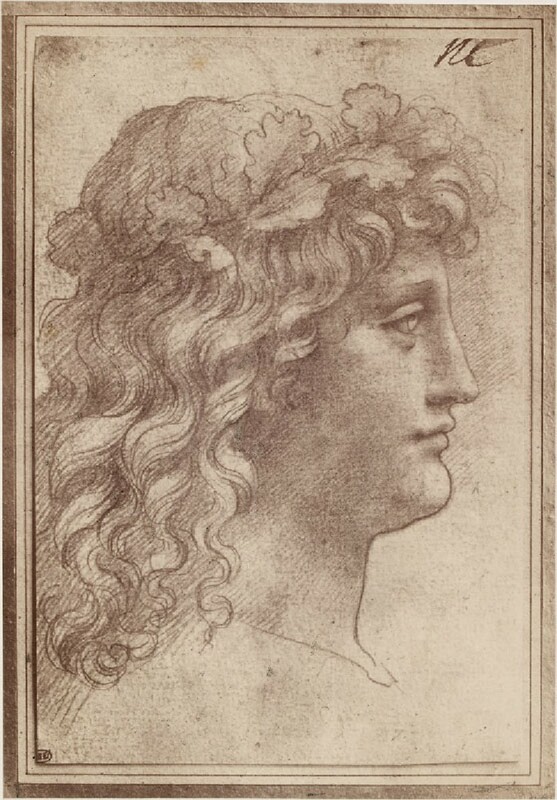 It may perhaps surprise you, if you have hitherto by any special predilection, studied only Christian art, to know that the design of this head, as of all others by the great religious masters, comes down in direct descent from types of Greek gods: this angel’s hair, and wreath of roses, are nothing more than a finished and tender development of the archaic Greek type of head-dress, which you will find characteristically given in my light sketch of the head of Triptolemus, in No. 126 in Case VIII . 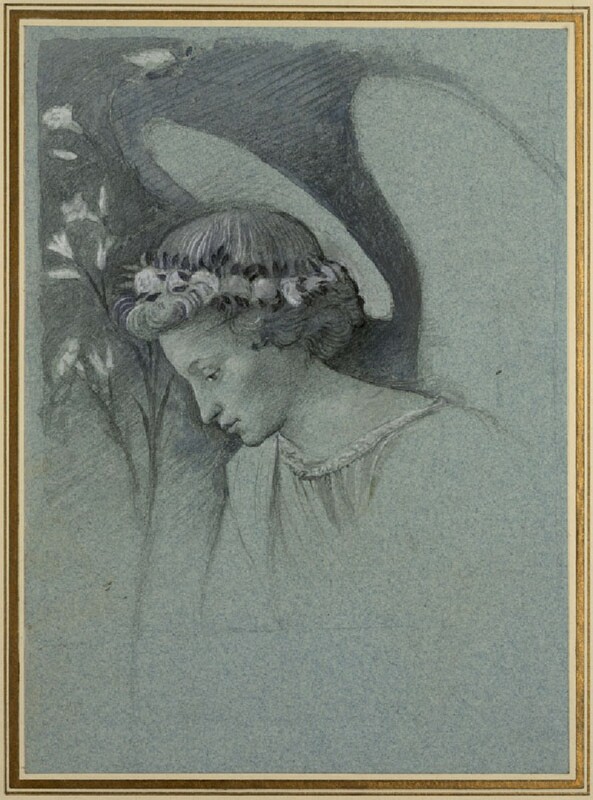 The knot of hair projecting over the forehead is curled downwards by Lippi in this angel’s head, and if you will draw the profile, you will find this action of the hair is one of the chief component elements in its expression of humility: the same cluster of hair is raised in front in Angelico’s angels, and turned into a waving flame; the hair on the top of the head is always smoothed into braids, of which every line is definite, by early Greek workmen, by Lippi, and Angelico; on the contrary, the sensational and dramatic schools throw the hair wildly loose; as you may see in the photographs from Michael Angelo in the larger room. It is very difficult for you at first, to discern the difference between the management of luxuriant hair by one of the perfect designers, and the loose treatment of the sensational school: but if you will try to draw part of the outline of the head of Cima’s Baptist, No. 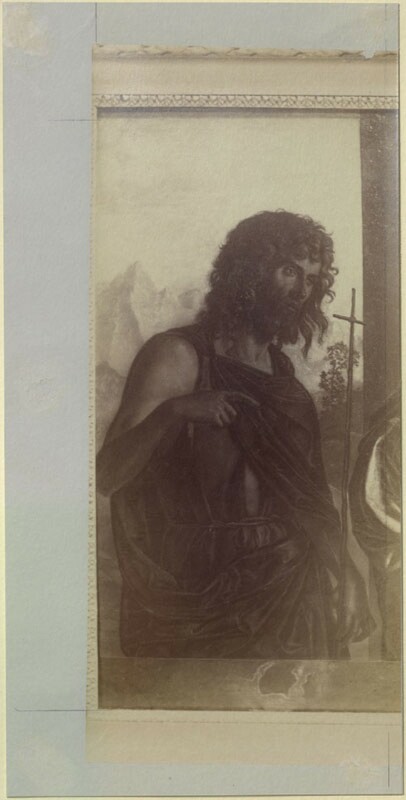 1 in this series,—of Dürer’s Adam, No. 10 of the Standards, or of Dürer’s Wild Man, in 32 of this series; and then a piece of Michael Angelo’s hasty and careless work in the head of the cherub behind the Ezekiel, you will soon find that the three first are not to be copied; the last quite easily so. In mistaken imitations of this licentious treatment of the hair by Michael Angelo , Sir Joshua Reynolds spoiled the composition of some of his best pictures; notably that of the group in Standard 43, in which the beautiful painting of the girl and her dress is out of Sir Joshua’s own heart; but the flying hair of the attendant black girl, as false in character as common in thought, is in imitation of Michael Angelo. 51. 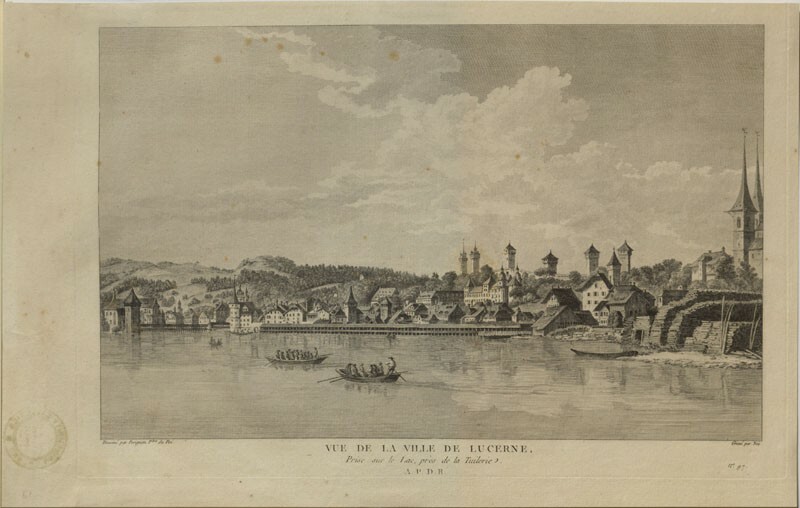 Scene on the Loire. 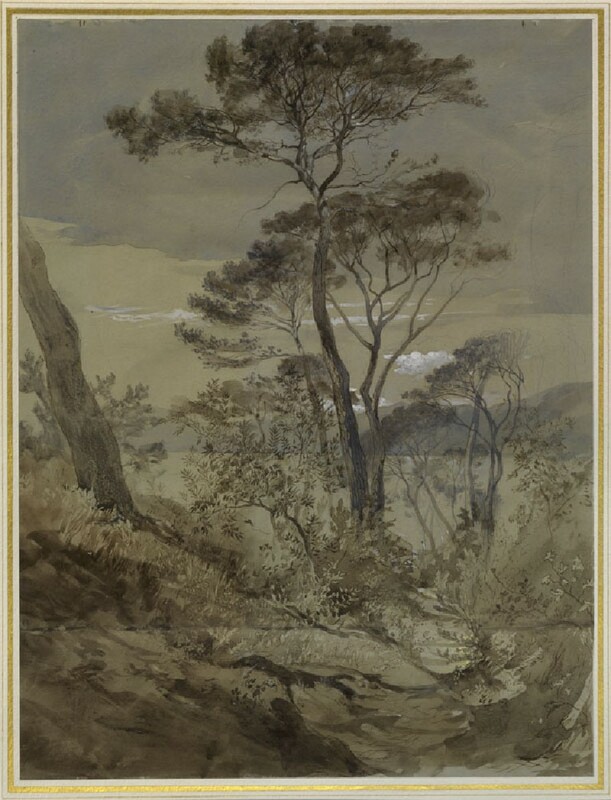 I introduce the landscape studies by this subject, because it illustrates the chief motive in sentiment with Turner, and with all great landscapists; rest, in clear air, and by sweet waters, after the day’s due labour. Compare the saw left in the wood, here, with the digger’s wheelbarrow and spade in 140; and the plough, in the last vignette to Rogers poems, datur hora quieti. This I put, in the second place, to be a witnessto you, once for all, of the right way to work:—doing nothing without clearly- formed intention, nothing in a hurry, nothing more wrong than you can help; all as tenderly as you can, all as instantly as you can; all thoughtfully, and nothing mechanically. Take those laws for absolute ones, in art and life. 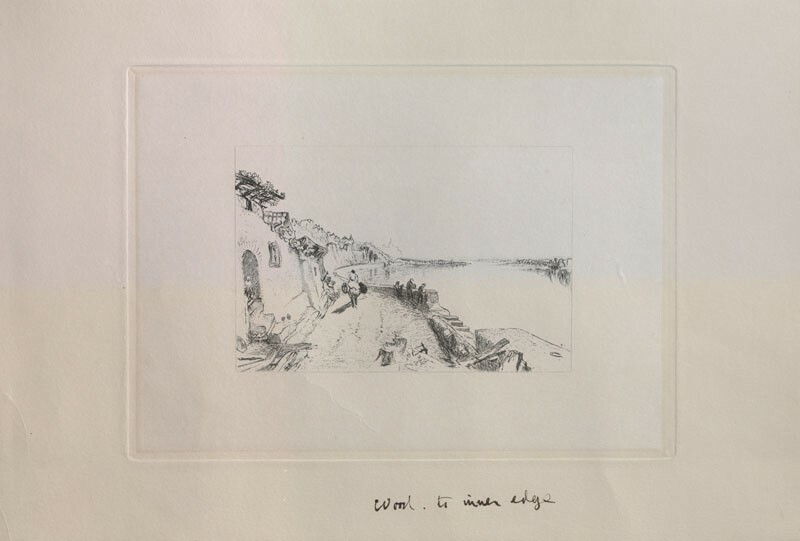 The drawing is of Turner’s early time. He was probably younger when he made it than most of you; but he never laid—I can say this positively of him—he never laid one thoughtless line in all his long life. Try to copy at least a small piece of the drawing. It will soon put all vulgar notions out of your head about rough paper, broad washes, and masterly touches. 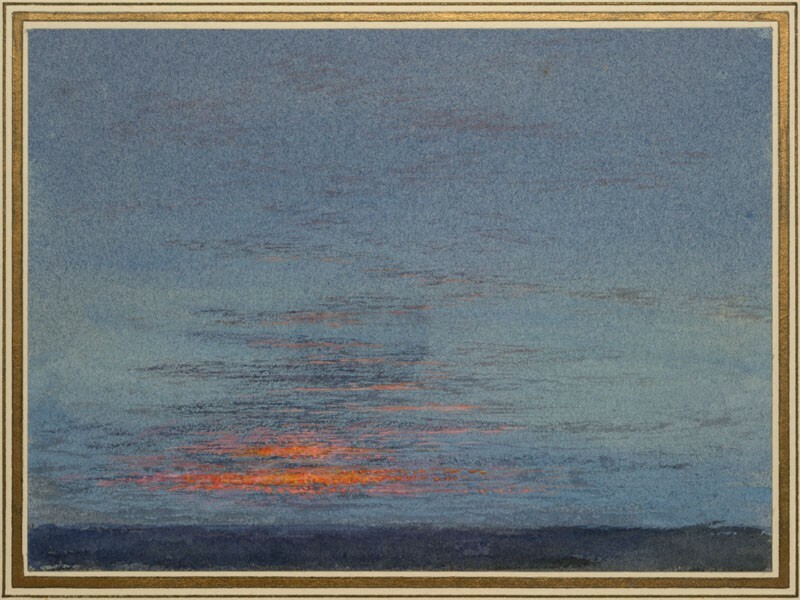 You will find that Turner’s touches were, for many a day, scholarly, before they were masterly, and so must yours be. 53. View of the Beautiful Island, Lake Maggiore. This and the next example are two plates out of what is to me, personally, a most precious book; the Picturesque Tour from Geneva to Milan, published by Ackermann in 1820, and illustrated with thirty-six coloured views by J. and J. Lory of Neufchatel; of which illustrations I have cut out these two, to my great loss—and your, at present, small gain, for you will little thank me for them; nor, more, probably, for the quiet old view of Schwytz and the Mythens , farther on in the series . But you will find what they are good for, in time,if you work rightly; and if you will not work, my explanation of their goodness would never become intelligible to you, nor could it be now, except through your courtesy, credible. 59. 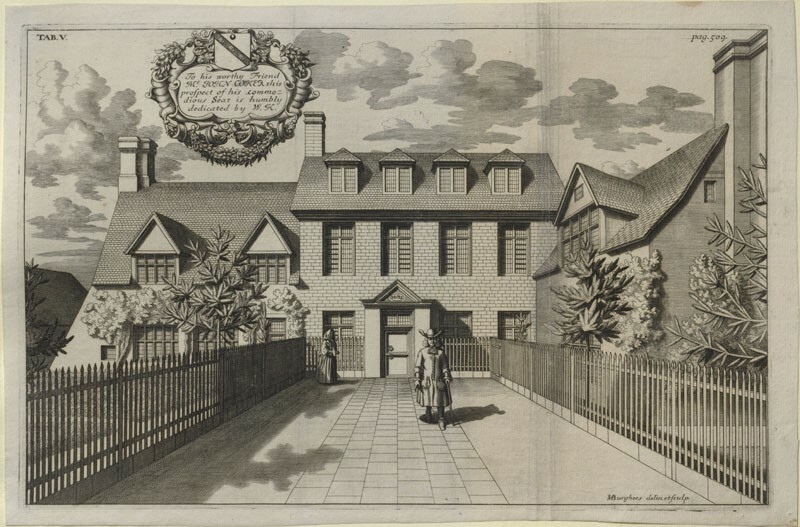 Mr. John Coker ’s Seat at Burcester-King’s-end. King Edward 3rd departed this life on June 21st (1375) , to whom succeeded his grandson Richard, eldest son of Edward the Black Prince. The new king, in the first year of his reign, granted to Sir John de Worth, Lord of the Mannor of Bigenhull, and his heirs for ever, the privilege of a Market on Fryday every week; and one yearly Fair to be held for three days, the Eve, day, and morrow after the Feast of St. James the Apostle; at his said Mannor of Biggenhull a small village now call’d Burcester-Kings-end, in the Street and Green whereof the Fair (formerly of great note) to this day yearly kept near the House of John Coker Gent. Lord of the Mannor , to whom it belongs. Parochial Antiquities Attempted in the History of Ambrosden, Burcester, and other adjacent parts in the Counties of Oxford and Bucks. By White Kennett, Vicar of Ambrosden.—Oxford: Printed at the Theater, MDC.XCV. 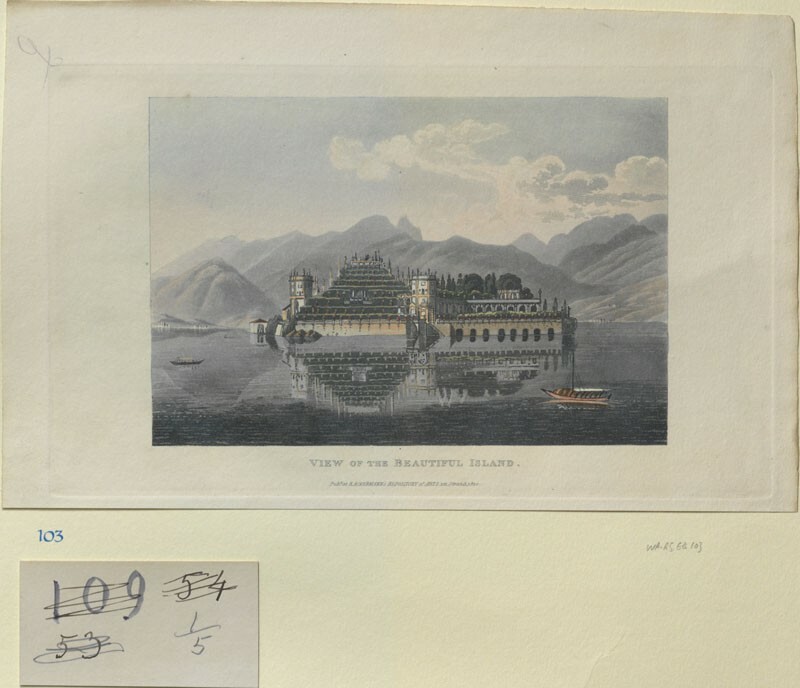 If you will compare this plate with that of the Baron’s Chateau, near Zug, in Switzerland , No. 66 , the two together will give you a strong impression of the distinctive habits and feelings of the higher middle-class life in the seventeenth century, before the great change in the temper of Europe was brought about by the irreligious literature of France and Germany, and the activities of America. Both of these had their office, and will fulfil it duly. Goethe has formed, directly or indirectly, the thoughts of all strong and wise men since his time. Rousseau laid the foundations of whatever is just in modern social theories or laws; and the Americans, over a large surface of the globe, will cut wood where it needs cutting: but, as yet, the change they have wrought is fatal, and bitterly to be mourned. You will doubtless smile, at first, at the pictures of the English Squire, and the Swiss Baron; but you may see and feel through the entire spirit of these, and all other art representing worthy men of that time, that they were perfectly happy, virtuous up to their ideal of duty, and healthy in their influence on all around them. It is a grave question, how many men are now living of whom so much can be said. It is the one chief question of your own lives, whether it will ever be truly said of you. I have placed, next to this English country-house, my copy of Turner’s drawing of another kind of country-house, about to receive a new guest . 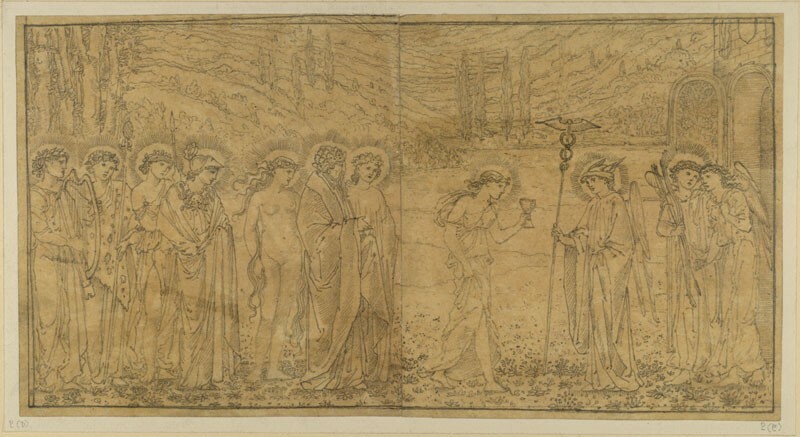 The contrast in feeling between this drawing and the old engraving will, I think, be at once felt by you; and both of them are characteristic, almost to extravagance, of the mental attributes of the age that produced them, which I shall be able to explain to you as you advance in general knowledge of the arts. The Baron of Zürlauben’s House at Zug. These two plates, with their companions, Nos. 65, 67, and 69, are taken from the Baron’s own important work on Switzerland, Voyage Pittoresque dans les Treize Cantons, with which Turner was evidently acquainted. He was continually in the habit of adopting subjects that interested him from the works of other artists, when he thought them susceptible of farther illustration; and I am quite certain that the two great subjects of the Liber Studiorum, Nos. 68 and 70, are only amplifications by him of the two plates, from this old book, which I have now framed beside them. 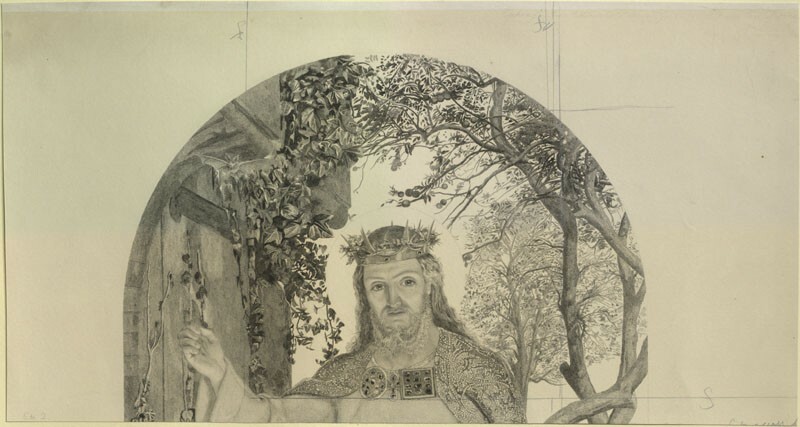 His drawing of Vevay, (at Farnley,) is little more than an investiture of the Baron’s engraving with colour. 148. Rostrum of common prawn, magnified. To show use of pencil and white for studies of organic form. It is nearly always necessary to make these on a larger scale than nature’s, else it is impossible to express the refinements of structure: but they should not be drawn by help of a lens; they should be the easy expression on a large scale of the form, attentively observed by the naked eye, at the distance which the size of the object may render convenient. Pieces of still life, which, with 149 and 150, are enough to show you the management of colour with surrounding shadow, as opposed to flat tinting; but note further in the Hunt its general look of greengrocery, and character of rustic simplicity, as opposed to the grave refinement of the Italian designers. Generally speaking, you will find our best modern art has something of this quality,—it looks as if done by peasants or untrained persons, while good Italian work is visibly by accomplished gentlemen. The reason of this, of course, primarily is, that our artists do not think their general education of importance, nor understand that it is an essential part of their eventual art-power; but it results also much from an Englishman’s delight in taking his own way, and his carelessness and general ignorance of vital abstract principle, so only that he gets a momentarily pleasant effect; which carelessness he thinks a practical turn of mind in him. I like to see a thing fudged out, said William Hunt once to me. Yes, but to see it felt out, and known, both out and in, is better still. Nevertheless, the simplicity has its own charm, when it is modest also; as in Hunt and Bewick: unhappily there is a tendency in the modern British mind to be at once simple and insolent: a most unfortunate base metal. Secondly, note of the method of work of this picture. It assumes that you are looking at the fruit very near it; and at that only. And the mode of finish is on those conditions admirable; but only on the condition, observe, that this piece of painting is to be no part of a larger scene. If these grapes were in the hand of a figure, and, to see the figure, you had to retire six or seven feet, all the laboriousand careful completion of bloom would be useless and wrong. Lastly, note in the Hunt, that though the peach is yellow, and the grapes blue, it is as easy to throw the blue fruit before the golden one, as it would have been to throw a cluster of golden grapes before a blue plum. And be advised, once for all, that there are no such things as retiring or advancing colours; but that every colour, well taught, is equally ready to retire when you wish it to retire, and to advance when you wish it to advance; and that you must by your own magic, and by that alone, command the delicate amber into the infinite of twilight, or complete it into the close bloom of the primrose in your hand. We were both of us, however, foiled, successively, in trying to get the exquisite outlines of this cluster. But it will give you some idea of the symmetry and precision of Mantegna’s design, and of his grave though, in this copy, too pale, colour. Copy it as well as you can. 2 I. Psyche received in Heaven. I cannot give you a better example of refinement of design obtained by perfectly simple and firm equality of outline; and of the decorative placingand arranging of every accessory. 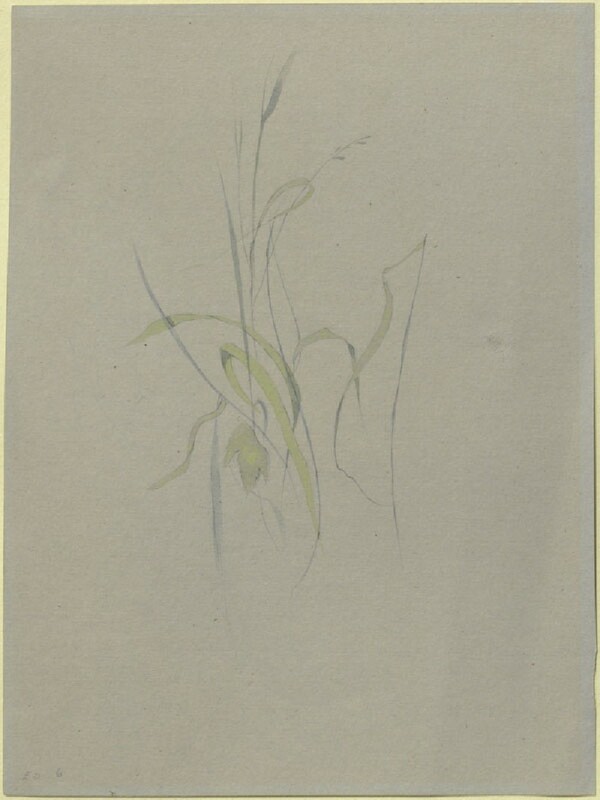 There is not a cluster of grass, nor are there two leaves set side by side, throughout the drawing, without perfectly invented decorative relation to each other. 2 K. Study from Tintoret. 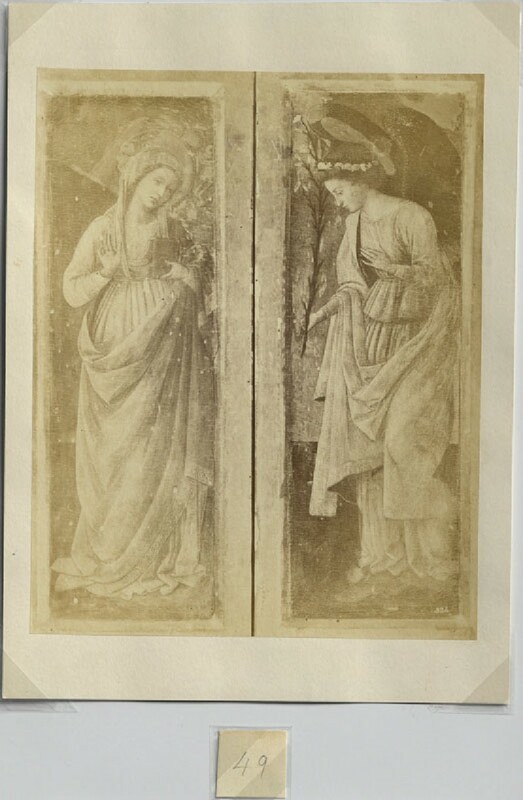 The first drawing in this cabinet shows you the value of subdued tints in pale colour, designed without reference to light and shade; this study and the one preceding may, in like manner, give you some idea of the subdued tones of dark colour employed in the higher schools of the Venetians after their complete acceptance of chiaroscuro as a collateral power. Placed here merely to show the importance of firm outline even in delicate work; and as an exercise in point-shading. The head itself is quite characterless, a bad imitation of the antique, and the hair and wreath careless and commonplace. You may alter the disposition of any of the curves in these, without the least loss to the design, (or rather attempt at design,) but you will find you cannot alter one line or tress of Luini’s Madonna, (49) without instantly finding you have done wrong. 3 J. The Angels appearing to the Shepherds. In saying that this etching is an example of every kind of badness, I do not of course mean every kind of weakness, though Rembrandt is weak, at all points, compared to other painters of equally high reputation;—indeed, his chief charm with the public is in his doing better than amateurs, what amateurs do. But this etching is an example of every vulgar method of work and habit of thought. It is ambitious, yet unscholarly; laborious, yet slovenly; minute without finish, gloomy without vigour, and careless without ease. Neither angels, men, cattle, or weeds, are in any one feature right, or in any one action decorous; long hours of toil have been spent in the ignoble attempt to get a candle-light effect, while all the principal figures in the subject are scrabbled entanglements of undecided line; and the effect of light is not got, after all. 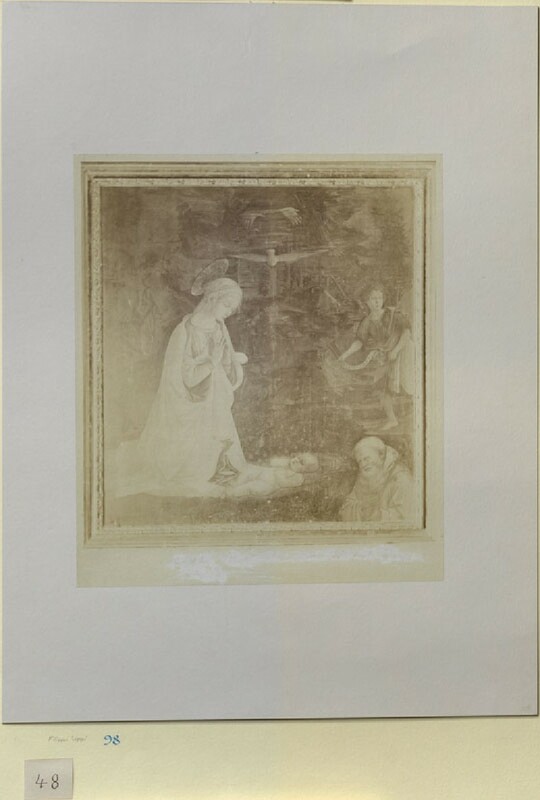 In Turner’s sepia sketch, 8 F, in Case XII. , you may compare with this the work of a real master of chiaroscuro. The dashing in of the sky has not cost him ten minutes’ labour, yet it is a creation, not only of light, but of exactly the quantity and kind of light he chooses; while Rembrandt works for hours (probably days) hesitating between the notion of a heavenly vision and of a sputtering candle. Finally, that you may better judge of the intelligence of form in the work, I have magnified the nearest wing of the angel, and set it, in the next frame, 3 K , under that of Dürer’s Greater Fortune; and I hope you will have no difficulty, in this one instance at least, in knowing good work from bad. 3 L. Calyx and stamens of bean-blossom (petals removed). Calyx and stamens of Rose Acacia-blossom (petals removed), both magnified; and blossom of Agrimony, natural size. 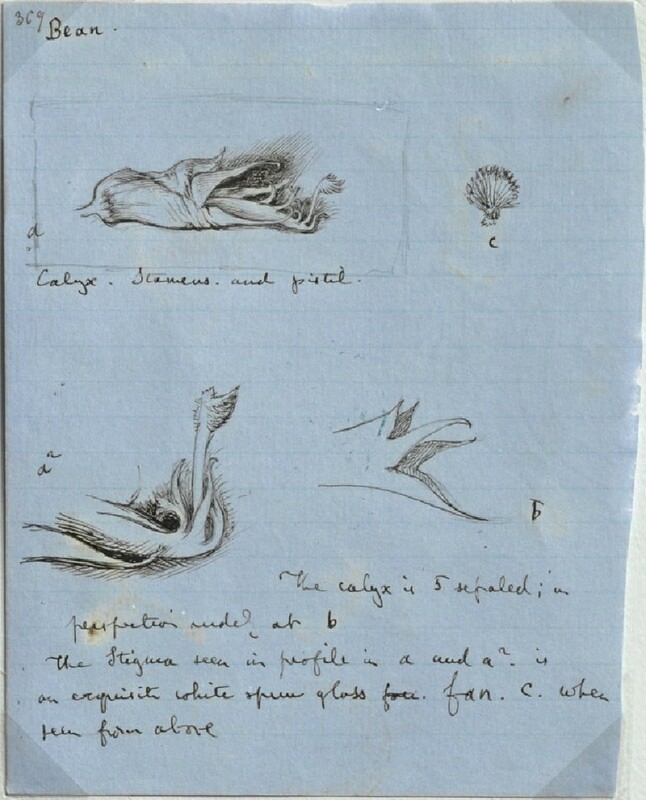 (R.) Pen and ink, on common blue-lined writing paper (leaves of my botanical note-book), touched with white. You will find this a most wholesome and useful manner of drawing. Take care always to keep leaning well on the firm outline: it is much easier to draw things as the bean-blossom is drawn, than as the agrimony is. The wonderful MSS. in St. Mark’s Library, at Venice, from which this drawing is copied, contains the earliest botanical drawings I know, of approximate accuracy. They are, however, like all previous work, merely suggestive of the general character of the plant, and are very imaginative in details. But I should like you to copy this one, because it will show you the delicacy and care of Venetian school-work; and farther impress on you the Venetian respect for law. Every plant, whatever its own complexity of growth, is reduced in this book to some balancedand ornamental symmetry of arrangement; not, as in our base mechanical schools, by making one side of every leaf or cluster like its opposite, but by making them different, yet lovely in relation. There is a beautiful piece of fancy in the page representing the common blue chicory. Its current Latin name in the fifteenth century, from its rayed form, was Sponsa Solis. But its blue colour caused it to be thought of as the favourite, not of the sun only, but of the sky. And the sun is drawn above it with a face, very beautiful, in the orb, surrounded by vermilion and golden rays, which descend to the flower through undulating lines of blue, representing the air. I have never seen the united power of Apollo and Athena more prettily symbolized.